Good Morning, this is Capital Essence’s Market Outlook (the technical analysis of financial markets) for Thursday February 7, 2019. Stocks closed slightly lower Wednesday in a lackluster trading session. For the day, the Dow Jones Industrial Average lost 0.1 percent to close at 25,390.30. The S&P fell 0.22 percent to 2,731.62, while the Nasdaq Composite declined 0.36 percent to about 7,375.28. The CBOE Volatility Index (VIX), widely considered the best gauge of fear in the market, fell more than 1 percent to 15.38. Chip stocks attracted buying support after Microchip said that the March quarter should be a “bottom” for revenues that presumably fueled broad-based buying interest. The VanEck Vectors Semiconductor ETF (SMH) surged 2.48 percent on the day and is up more than 16 percent YTD, outperformed the S&P. Now the question is whether the rally has more legs? Below is an update look at a trade in SMH. Our “U.S. Market Trading Map” painted SMH bars in green (buy) – see area ‘A’ in the chart. The first dominant feature on the chart is the downward trend starting in 2015. The second dominant feature of the chart is the downward trend since late 2018, which represents the digestion period. Over the past few weeks, SMH has been trending higher after the late 2018 selloff found support near the 4-year moving average. This week’s rally pushed the ETF up against the 1-year moving average, a key technical level based on moving averages. A close above that level has measured move to 114, or the 2018 highs. SMH has support near 96. Short-term traders could use that level as the logical level to measure risk against. Short-term technical outlook remains bullish (buy). Last changed January 30, 2019 from bearish (sell) (see area ‘A’ in the chart). S&P rebounded nicely after the early selloff attempt found support near the lower boundary of the pink band. This level was significant when the index climbed above it in late January. Momentum indicator shifted lower from overbought zone, suggesting further short-term weakness likely. Nevertheless, Money Flow measure is still above the zero line, indicating a positive net demand for stocks. 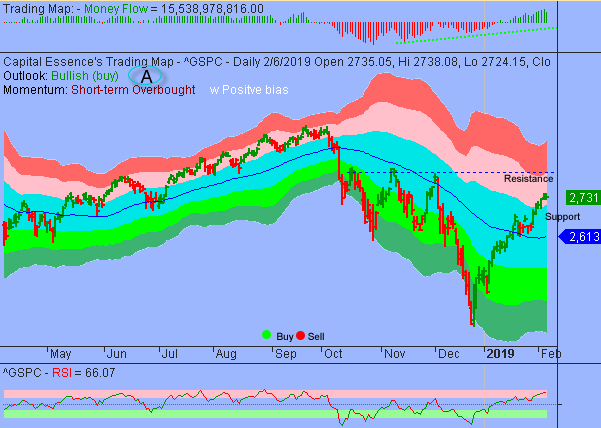 These elements increased the probability that the index will be basing sideways as the market digests overbought conditions rather than correcting significantly lower. For now, 2700 represents a major price support. Expect the index to draw in buyers in any pullback to that level. Meanwhile, a close below it signals a short-term trend reversal and a test of the trend channel moving average, currently at 2613, should follow shortly. Short-term trading range: 2680 to 2740. S&P has psychological support at 2700 while key support is at 2680. The index has resistance near 2740. A sustain advance above that level has measured move to 2800. Long-term trading range: 2400 to 2830. S&P has support near 2400. A close below that level on a monthly basis has measured move to 2340. The index has resistance near 2720. A close above that level has measured move to 2830. In summary, several key technical indicators suggest that S&P is in a midst of a short-term consolidation phase. The fact that the index managed to hold on to most of recent gain in the face of such extreme overbought condition, indicating an internal strength. This increases the probability that the S&P will break out from current trading range as soon as the market shakes off excessive optimism.